The grave of 1667 Lieutenant Joseph Arnold Blacket, age twenty four years, 27th Battalion, of Norwood, SA, killed in action 10 June 1918, in Franvillers Communal Cemetery Extension. In the background is the cross bearing the name of 132260 Lance Corporal Joseph James Francis, 160th Tunnelling Company, Royal Engineers, who died on 20 July 1918, age 22; 4776 Private Keith William Evans, 56th Battalion, enlisted Balmain, NSW, killed in action 18 July 1918. 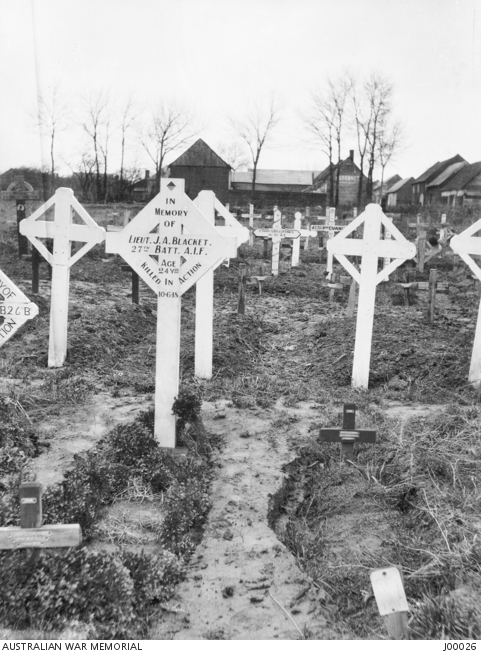 This image is one of a set of photographs of the original graves of some members of the 27th Battalion. The Battalion funded the purchase of the camera through its adjutant Captain (Capt) Southon for 5541 Pte G R Barrington to photograph the graves. The camera and negatives were then acquired by Major John L Treloar on behalf of the Australian War Museum, reimbursing costs for the camera to Capt Southon.